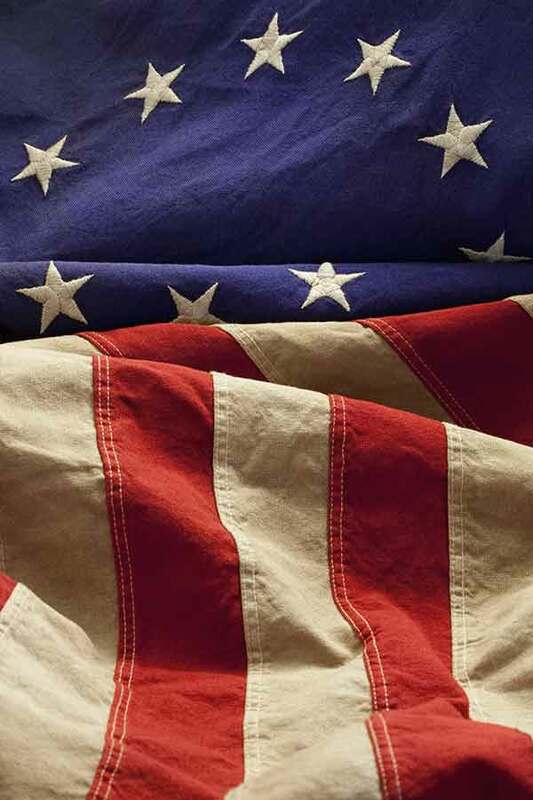 The early days of the American Revolution led to the use of many flags as the colonists struggled with the aims of the revolt, whether rights within the British Empire or outright independence. Early designs tended to be modifications of British flags until the colonials took the path of independence in 1776. From that point on, the flags of the United States took their own distinct path. 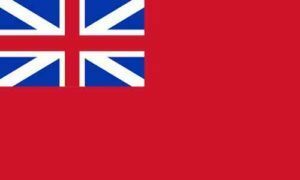 British Red Ensign, also called the “Colonial Red Ensign” and the “Meteor” Flag, was adopted by Queen Anne as the new flag for England and her colonies in 1707. This was the best known of the British Maritime flags, or Ensigns, which were formed by placing the Union flag in the canton of another flag having a field of white, blue or red. 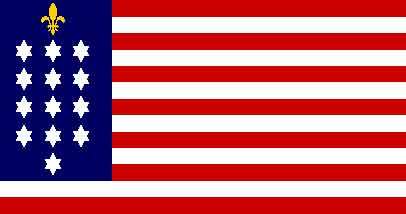 This flag was widely used on ships during the Colonial period. 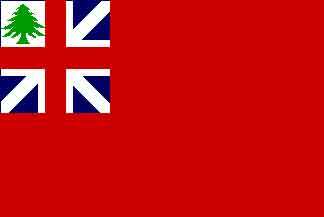 This was the first national flag of the English colonies, and Cornwallis surrendered at Yorktown under this flag. Flags with the word “Liberty” on them came to be called Liberty Flags and were usually flown from Liberty poles. 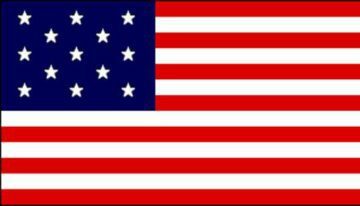 They were flags of protest and petition flown throughout the Thirteen Colonies during the five years prior to the outbreak of the Revolution. They proclaimed loyalty to the Crown, but laid claim on behalf of the colonists to the rights of Englishmen, and called for a union of the colonies against current English colonial policies. In 1771, a liberty pole was erected the center of the City of Schenectady, New York, as a protest of British policies and interference in the communities’ affairs. On top of this Liberty Pole hung a homemade blue silk flag measuring 44 by 44 inches with the word “LIBERTY” in white sewed on one side. Later, this Liberty flag was reportedly carried by the First New York Line Regiment, who largely came from Schenectady, between 1776-1777 during the revolution. Today, it is one of a handful of a pre-revolutionary flags known to exist. The history of the Pine Tree as a symbol of New England predates the European colonial settlements. In eastern Massachusetts, southern New Hampshire and the southern corner of Maine, there lived a nomadic tribe of Native Americans known as the Penacook. The Penacook people have been credited with teaching the Pilgrims of Plymouth Colony much needed survival skills when the colonists were starving to death during the winter of 1621-22. After the St. Andrews Cross was added to the St. George’s Cross to make the Union Flag in 1707. The New England Flags sometimes showed the British Red Ensign with the tree in the first quarter as demonstrated in the second variant of New England Flags shown here. The history of the Stamp Act flag began in about 1765, when protests of the duties and taxes and stamps required by Parliament began in the colonies. 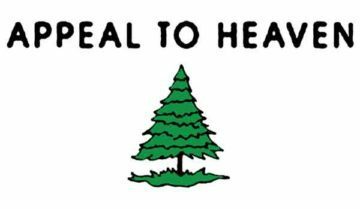 After a protest of the Stamp Act was held under an Elm tree in Boston, the tree became known as the “Liberty Tree,” and a protest group known as the Sons of Liberty was formed. The Sons of Liberty continued to meet under this tree, so the British cut the tree down, and the Sons replaced it with a Liberty pole. A flag of nine red and white vertical stripes known as the “Rebellious Stripes” was flown from this pole. 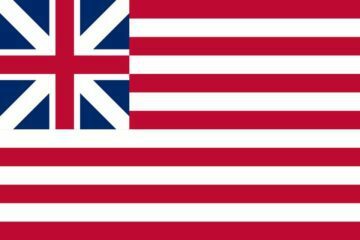 When the British outlawed the “Rebellious Stripes” flag, tradition tells us the Sons of Liberty created a new flag by changing the direction of the stripes. 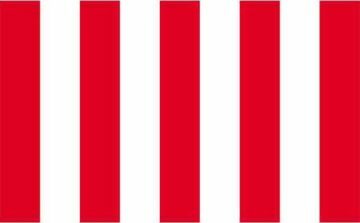 Three and a half years after the Boston Tea Party, the nine stripes had grown to thirteen horizontal stripes. The Bedford Flag may be the oldest complete flag known to exist in the United States. It’s description matches one made for a cavalry troop of the Massachusetts Bay Militia in the French and Indian Wars. Legend claims it is the flag carried by Bedford Minuteman, Nathaniel Page, to the Concord Bridge on April 19, 1775, at the beginning of the American Revolution. There is, however, no real proof, either from testimonials or diaries that mention any flag flown that day by either side, except one by a British officer (Lt. Barker), who reported that British grenadiers chopped down and destroyed a flag and liberty pole standing on a hill near Concord Center. However, he reports that this was done hours before the Bedford’s militiamen arrived at Concord. 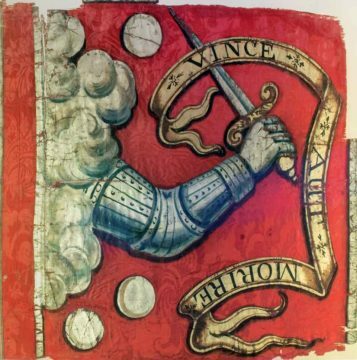 The Latin inscription “Vince Aut Morire” means “conquer or die.” The arm emerging from the clouds represents the arm of God. The original is housed at the Bedford, Massachusetts Town Library. 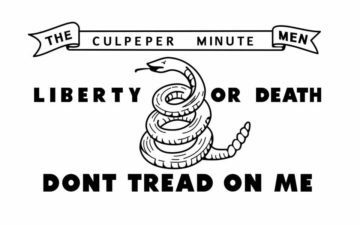 This flag represented a group of minutemen from Culpeper, Virginia. These men formed part of Colonel Patrick Henry’s First Virginia Regiment of 1775. Three hundred Culpeper Minutemen led by Colonel Stevens marched toward Williamsburg at the beginning of the fighting. 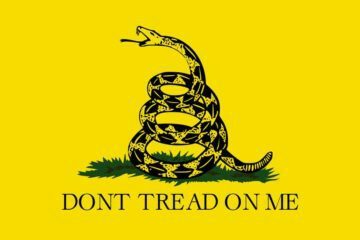 The rattlesnake was the favorite animal emblem of the Americans even before the Revolution. In 1751, Benjamin Franklin’s Pennsylvania Gazette carried a bitter article protesting the British practice of sending convicts to America. The author suggested that the colonists return the favor by shipping a cargo of rattlesnakes to England, which could then be distributed in the noblemen’s gardens. Three years later, the Gazette printed a political cartoon of a snake as a commentary on the Albany Congress. To remind the delegates of the danger of disunity, the serpent was shown cut to pieces. 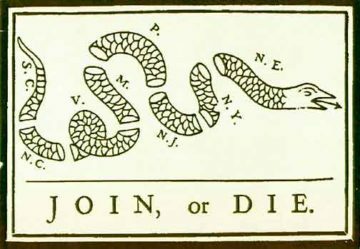 Each segment is marked with the name of a colony, and the motto “JOIN or DIE” below. Other newspapers took up the snake theme. 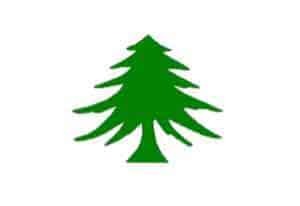 The term Pine Tree flag is a generic name for a number of flags used by the New England and Massachusetts colonies from 1686 to 1778. The Pine Tree has been a popular symbol of American independence in New England for years. 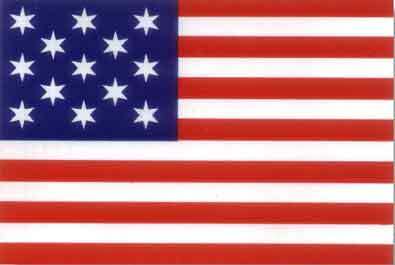 This flag was used by George Washington on a squadron of six schooners which he outfitted at his own expense in the fall of 1775. Unfortunately, there is controversy over the placement of the words, appearance of the trees and leaves, direction of branches, etc. It leaves us with many possible versions of these flags. Massachusetts is one of three states with its own naval ensign, the others being South Carolina and Maine. 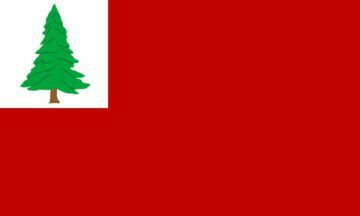 In April 1776, the Massachusetts Navy adopted as its flag (naval ensign) a white field charged with a green pine tree. It also flew this flag over the floating batteries which sailed down the Charles River to attack the British in the Siege of Boston. This naval militia was active during most of the Revolutionary War. It was founded to defend the interests of Massachusetts from British forces. The navy used 25 vessels over the course of the war, acting in various roles such as prison ships, dispatch vessels, and combat cruisers. Unlike most other states, the Massachusetts State Navy was never officially disbanded and simply became part of the United States Navy. In 1775, Colonel Christopher Gadsden was in Philadelphia representing his home colony of South Carolina at the Continental Congress and presented this new naval flag to the Congress. It became the first flag used by the sea-going soldiers who eventually would become the United States Marines. This flag first saw combat under Commodore Hopkins, who was the first Commander-in-Chief of the new Continental Navy, when Washington’s Cruisers put to sea for the first time in February of 1776 to raid the Bahamas and capture stored British cannon and shot. In the early days of the Revolution, the New Yorkers adopted a white flag with a black beaver for the armed ships of New York. 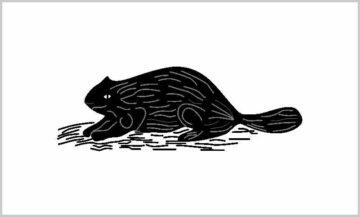 According to legend, the New Yorkers hauled down the British flag in 1775 and raised a plain white flag with a drawing of a black beaver centered on it to mark the occasion. The symbol of the Beaver dated back to the early Dutch settlers of New Netherlands and was based on the long and important role the fur trade played in the development of New York. According to legend, one day in 1775, General Washington approached Rebecca Flower Young, a Philadelphia pennant and colors maker, and asked her to make a flag for use by the troops. The flag he designed became known as the Grand Union Flag. Years later, Rebecca assisted her daughter in making an even more famous flag for our country, the “Star Spangled Banner” used at Ft. McHenry. 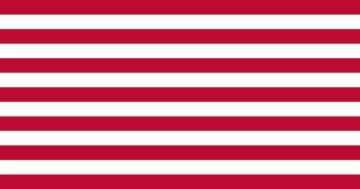 This flag was never officially sanctioned by the Continental Congress, but was in use from late 1775 until mid 1777, probably because it was very simple to make. According to legend, on January 1, 1776, this flag was first raised at Cambridge, where George Washington took command of the Continental Army. 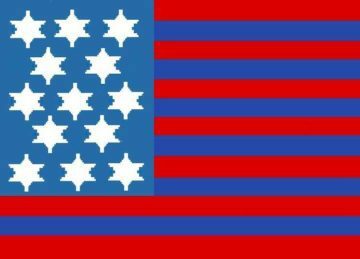 Although this flag was known as the Continental Colors because it represented the entire nation, in one of Washington’s letters he referred to it as the “Great Union Flag” and it is most commonly called the “Grand Old Union Flag” today. On the nights of June 16-17, 1775, the Americans fortified Breed and Bunker Hills which overlooked Boston Harbor. Although they had not officially declared their independence, a fight for control of the hills became necessary. When the British advanced up the slope the next day, according to legend they saw a red flag, but we have no real knowledge of which American Flag was actually flown in this battle. But John Trumbull, whose paintings of Revolutionary War scenes are quite famous, talked to eye-witnesses and his subsequent painting depicting the battle displayed the Continental flag as shown here. 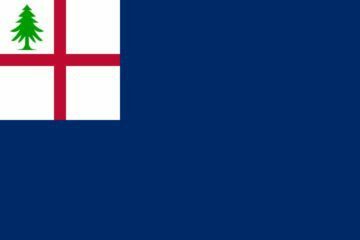 Many historians think the flag more likely to have been at the battle, if any, was the more common First New England Naval Ensign. 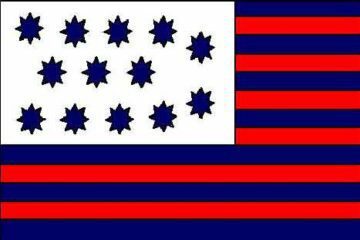 This so-called “Bunker Hill Flag” with a blue field was the result of an error made by a publisher a couple of hundred years ago. On a flag book this flag, representing New England, was correctly printed with heraldic hatching clearly indicating a red field, but it was hand-colored blue by mistake. This error has lived on to this very day. This flag was carried by Colonel William Moultrie’s South Carolina Militia on Sullivan Island in Charleston Harbor on June 28, 1776. The “Moultrie” Flag was designed in 1775, and flew over Fort Sullivan (later named Ft. Moultrie) during the battle. The flag was shot away by the British in the battle, but the British were in turn defeated which saved the south from British occupation for another two years. 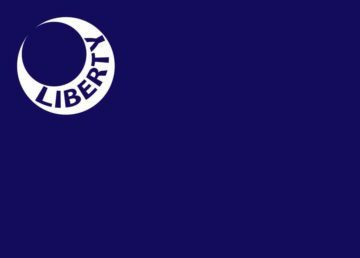 This became the flag of the South Carolina “Minute Men” and the modern South Carolina State Flag still contains the crescent moon from this Revolutionary War flag. On June 14, 1777, the Continental Congress passed a resolution adopting an official flag for the Colonial forces. It contained no drawings or illustrations of what the flag should look like, just these words. 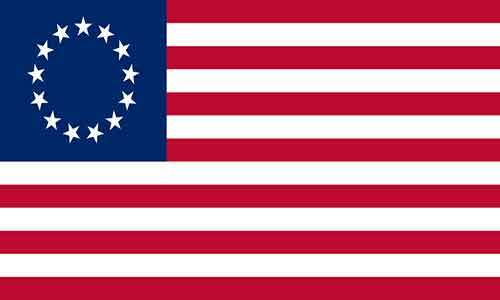 Betsy Ross Flag – This is the flag design that legend says was created by Betsy Ross for George Washington. According to tradition, in June of 1776, Betsy Ross, who was a widow struggling to run her own upholstery business sewed the first flag. Upholsterers in Colonial America not only worked on furniture, but did all manner of sewing work, which for some included making flags. 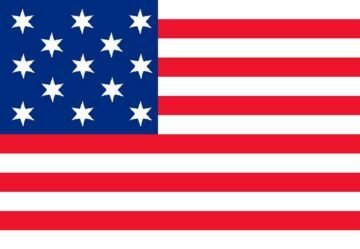 According to the legend, General Washington, Robert Morris, and John Ross showed her a rough design of the flag that included six-pointed stars. Betsy suggested a five-point star because it was easier to make, and demonstrated how to cut a five-pointed star in a single snip. Impressed, the three entrusted Betsy with making our first flag. 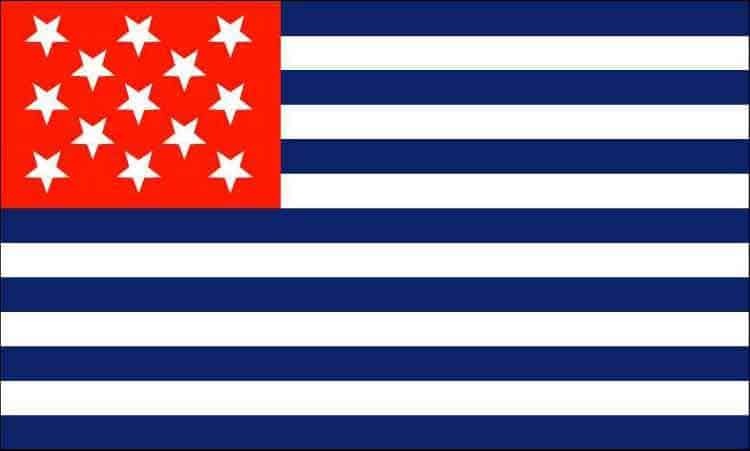 George Washington’s Headquarters Flag – This unique flag was flown at the headquarters of General George Washington during most of the Revolutionary War. This flag has been widely called the “personal” flag of George Washington and reportedly made as a headquarters flag in 1777. According to this tradition he used this flag throughout the whole Revolutionary War. 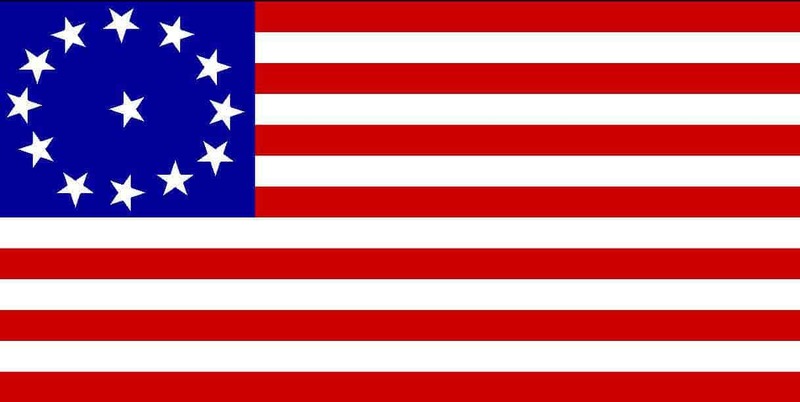 Unfortunately, there has been no proven connection that this flag ever belonged to, or was used by, General Washington. Today, a modern reproduction of this “Washington” flag still flies at his Valley Forge Headquarters, but there is no period documentation or proof to support it ever being an actual flag used during the Revolutionary War. Many give credit for the design of the first Official “Stars and Stripes” to Francis Hopkinson, a Congressman from New Jersey, and signer of the Declaration of Independence. His reported design had the thirteen stars arranged in a “staggered” pattern. Although there is no original example or drawing remaining of this flag, we do have the bill he gave Congress for its design. Congressman Hopkins asked Congress for a quarter-cast of public wine for his work. There is no record of Congress ever paying him. 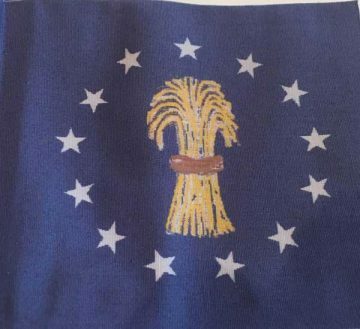 An interesting bit of erroneous research done on this flag in 1931 resulted in it being mistakenly tied to the wrong Robert Wilson and to the 7th Pennsylvania Militia Regiment, although no actual connection between this flag and the Pennsylvania’s regiment existed. Recent research by flag scholar John Hartvigsen indicates that this flag was actually the colors of the Chester County Militia, not the 7th Pennsylvania Militia Regiment. According to Hartvigsen’s well-documented research, it was a “Robert Wilson” of Chester County, Pennsylvania, serving as a Lieutenant Colonel with the Chester County Militia, who was responsible for the militia’ equipment, and for this flag’s survival. Several other members of the Wilson family also served with the Chester County Militia and were present at the Battle of Brandywine. According to tradition this flag flew over the military stores in Bennington, Vermont, on August 16, 1777. There, the American militia, led by Colonel John Stark, defeated a large British raiding force led by British General John Burgoyne in order to protect military supplies at Bennington. The battle was won when Ethan Allen and Seth Warner, who led the Green Mountain Boys, arrived with cannon and supplies taken from Fort Ticonderoga. Colonel Stark was later promoted to general and after the war was given land in the Ohio River Valley, present day Stark County. When General Stark died, he was the oldest (last) Revolutionary War general. 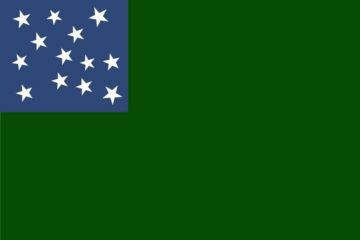 A notable victory of the Green Mountain Boys occurred on the morning of May 10, 1775, when they silently invaded the British held Fort Ticonderoga and demanded its surrender. The captured cannon and mortars were then transported across the snow covered mountains of New England. This surprise installation of some of these on the heights over Boston Harbor enabled George Washington to force the British to leave that important harbor. On August 16, 1777, the Green Mountain Boys fought under General Stark at the Battle of Bennington. 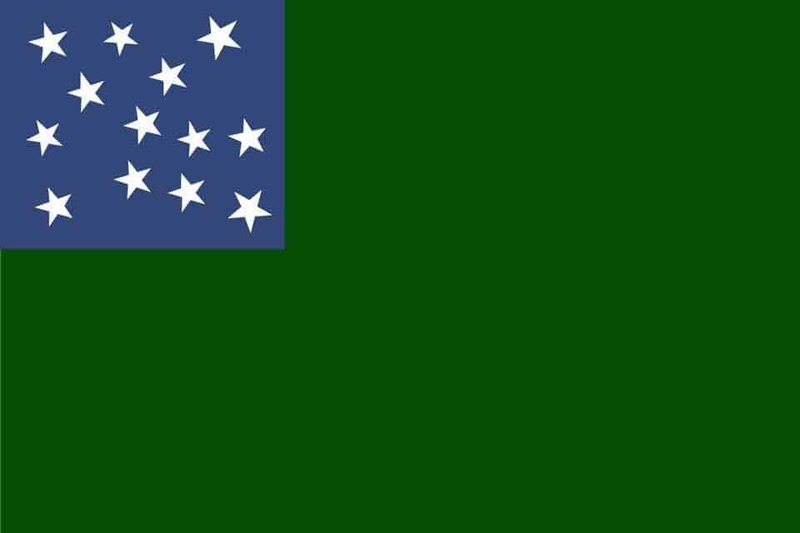 This flag’s green field made sense when you realized the Green Mountain Boys carried the flag in the forest. Bright red and white stripes were not very practical there. As in many American flags, the stars here were arranged in an arbitrary fashion. Nevertheless, they signified the unity of the Thirteen Colonies in their struggle for independence. In 1777, two forts were constructed on the Delaware river. One was Fort Mercer on the New Jersey side, and the other was Fort Mifflin on the Pennsylvania side opposite Fort Mercer. So long as the Americans held both forts, the British army in Philadelphia could not communicate with the outside world or be resupplied. General William Howe, the commanding British general in Philadelphia, sent General Charles Cornwallis with 5,000 men to attack Fort Mercer, landing them by ferry three miles south of the fort. Rather than let the garrison be captured by the overwhelming British forces, Colonel Christopher Greene decided to abandon the fort on November 20, leaving the British to occupy it the following day. The British then began an assault on the neighboring Fort Mifflin. During the 5-day siege of Fort Mifflin, the flag remained flying, despite the largest bombardment in North American history up to that point with over 10,000 cannonballs shot at the fort. At one point the flag was shot from the pole and two soldiers were killed raising it once more. This was the only time the flag wasn’t flying throughout the constant barrage. Although the Fort did not surrender to the British, eventually it was evacuated because of the extensive damage and the defenders fled to safety in New Jersey. Today, this flag still flies over the restored fort. On September 23, 1779, John Paul Jones lost his first ship, the USS Bon-Homme Richard, in battle with the British frigate HMS Serapis. As the Bon-Homme Richard sunk, he boarded and captured the Serapis, then sailed the badly damaged prize ship into the Dutch harbor of Texel, where it eventually was turned over to the French. The British Ambassador demanded the ships Serapis and Alliance, and their crews, be seized as pirates “because they flew no recognized flags,” and turned over to them. 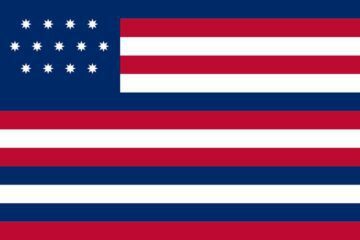 The story behind this flag was that our Ambassador to France, Ben Franklin, was then asked what the new country’s flag looked like. A flag based on Franklin’s faulty description was then painted for the French court, who officially recognized it. Copies were then sent to various European ports including Texel, where the harbor master showed John Paul Jones the drawing of Franklin’s version of the American flag. Jones had one made and proudly raised this flag when he sailed back to the colonies on the Alliance. 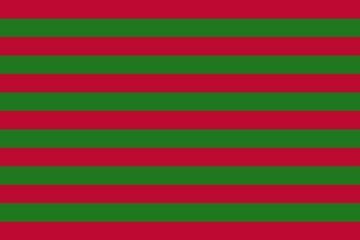 This red and green striped flag was used by General George Rogers Clark during his attack on the British held Fort Sackville during the American Revolution in 1779. Fort Sackville was a British outpost located in the frontier settlement of Vincennes. His celebrated capture of Kaskaskia in 1778 and Vincennes in 1779 greatly weakened British influence in the Northwest Territory. 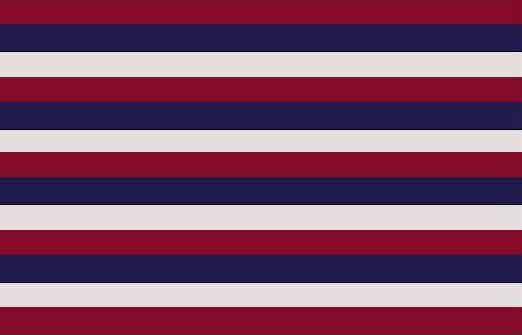 This was the flag of the 36-gun Continental Navy frigate, USS Alliance, one of finest warship built in America during the Revolution. During the war, the Alliance flew an ensign with seven white stripes, six red stripes, and thirteen eight-pointed stars. Under Captain John Barry, she captured three enemy privateers and three Royal Navy warships during 1781-1783. She carried American diplomats to France for the peace talks, and fired the last shots of the Revolution in an engagement with two Royal Navy warships in 1783. Her final Revolutionary War service was carrying the Marquis de Lafayette back home to France. 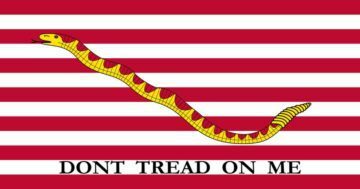 The “Don’t Thread on Me!” and Rattlesnake Ensign has become a powerful American symbol which tradition tells us was used by the Continental Navy in 1775 and is now being used again by the U.S. Navy in the War on Terrorism. Although there is widespread belief that ships of the Continental Navy flew this jack, there is no firm bases of historical evidence to support it. We have several fanciful contemporary pictures showing a very youthful Commodore Esek Hopkins, our First Navy Commander-in-Chief, that appeared in Europe during the Revolution that showed flags flying from both the bow and stern of his ships. In some pictures the rattlesnake flag appears, and in others we only have stripes. 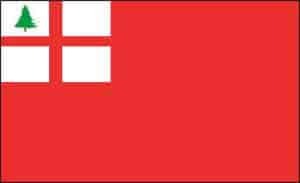 In short, there is strong reason to believe that the actual Continental Navy Jack, like the Colonial Merchant Ensign, was simply a red and white striped flag with no other adornment. 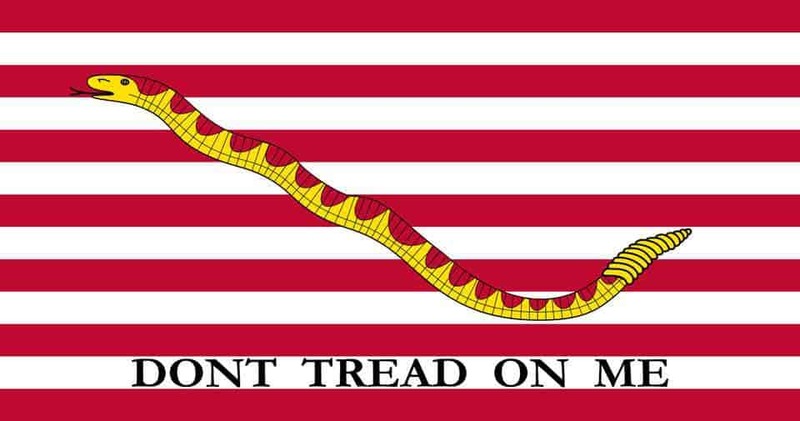 It should also be noted that the so-called First Navy Jack was probably not a Jack at all, but an ensign. The first official documented US flag had also a staggered star pattern and was used by the navy. 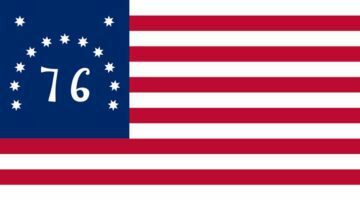 On April 24, 1778, Captain John Paul Jones, in command of the USS Ranger and flying this flag, became the first American officer to have the American flag recognized by a foreign power. 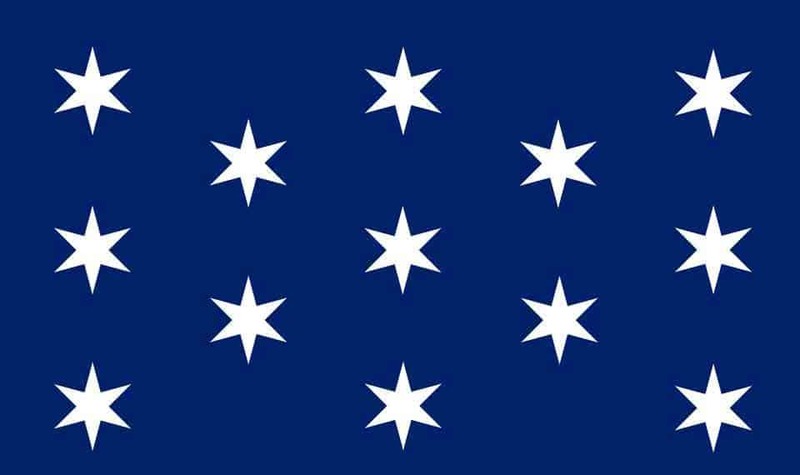 Although very similar to the original Hopkin’s flag, this flag replaced the six-pointed stars with the more traditional five-pointed “American” stars. At the Battle of Cowpens, General Daniel Morgan won a decisive victory against the British in South Carolina on January 17, 1781. This colonial victory forced Cornwallis to come to the aid of the defeated British forces and led to another costly battle for the British against Nathaniel Greene’s forces at Guilford Courthouse in North Carolina. The Cowpens Flag, according to legend, was carried at the Battle. 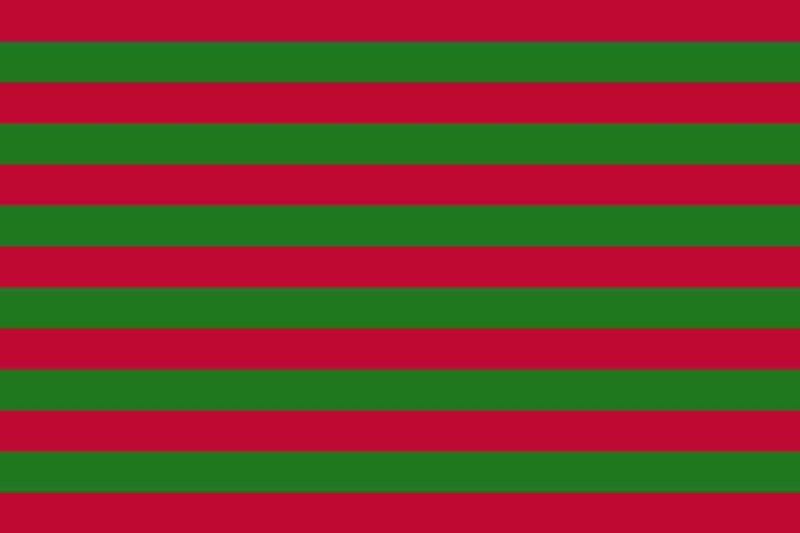 In reality, the flag was the regimental flag of the Third Maryland Regiment, and this unit had been disbanded just prior to the battle. Some historians claim that members of the disbanded regiment were reassigned to other units present at the battle, and it was these soldiers who carried their flag, although others claim the flag as one not used until the War of 1812, rather than a Revolutionary flag at all. Tradition tells us that this flag was raised over the Guilford Courthouse in North Carolina on March 15, 1781. There, under the leadership of General Nathaniel Greene, the militiamen halted the British advance through the Carolinas and turned them back to the seaport towns. This was one of the bloodiest battles of the Revolutionary War with the British losing over 25% of their troops. 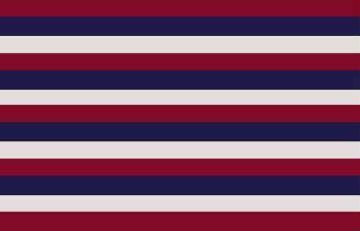 This unique Flag has an elongated canton and blue and red stripes. 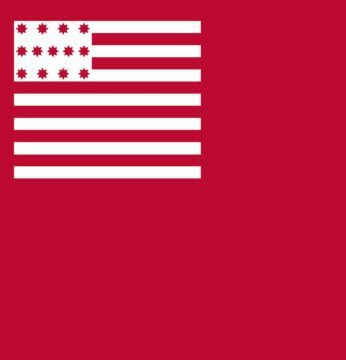 However, since it was common practice for military units to carry flags that featured common American symbols (such as stripes and stars), but to make them uniquely identifiable for use as their regimental flags, this flag was probably never intended for use as a national flag. According to an article appearing in National Geographic Magazine on historical flags (1917), this was the flag of the South Carolina Navy during the American Revolutionary War. The flag is essentially the same as the Continental Naval Jack. 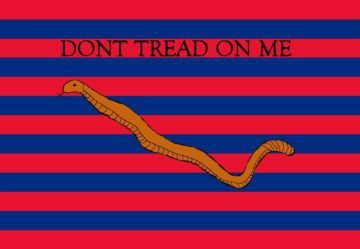 With this flag, the motto “DON’T TREAD ON ME” appearing on the third red stripe from the top, and using stripes with the colors of Scotland (blue) and England (red). 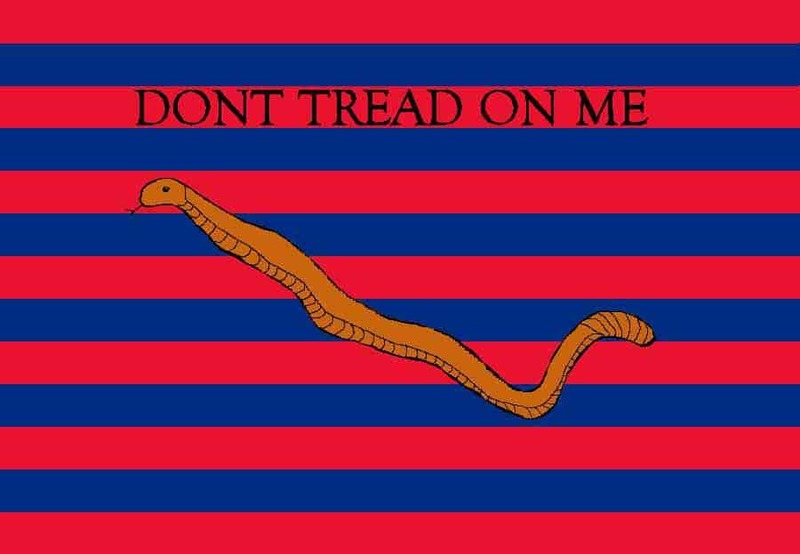 The provincial legislature of South Carolina did not intend for the rattlesnake on red and blue striped flag to become the symbol of its navy. Within days of the British surrender at Yorktown on on October 19, 1781, an American artillery officer named Major Sebastian Bauman (2nd New York Artillery Regiment) drew a map with this flag pictured on it. It was later engraved by Robert Scot of Philadelphia and published . Bauman had carefully surveyed the terrain and battle positions at Yorktown, at the siege of Yorktown. Bauman had emigrated to America from Germany after service in the Austrian army. During the Revolution, he served in the campaigns in New York, New Jersey, and Pennsylvania, and was in command of the artillery at West Point, before joining Washington at the siege of Yorktown. During the battle of Yorktown in October, 1781, this flag flew on the right flank of the American troops. A 26 year-old British Lieutenant Colonel named John Graves Simcoe, in command of the Queen’s Rangers at Yorktown, painted this from his station across the river. Many flag historians believe that the flag was between Simcoe and his position at Gloucester Point and the sun, thus resulting in the strange colors he perceived. After the war, Simcoe went on to become Upper Canada’s first lieutenant-governor and probably the most effective of all British officials dispatched from London to preside over a Canadian province. In 1781 and 1782, in honor of the end of the American Revolutionary War and the help of France in that conflict, a special U.S. Flag appeared. It consisted of 13 red and white stripes with a very long (11 stripes long) canton bearing either 12 or 13 white stars and a gold fleur-di-lis. The stars are shown in contemporary illustrations either as 5 pointed or as 6 pointed in rows of three (with a single star below if there are 13) and the fleur at the top.